Thank you. Here are the before and after photos of my daughters hair which became severely matted when she was confined in a spica cast for a femur fracture (break in the upper leg bone). She was in too much pain to move the first few days so I could not comb the back of her hair. In a just that short time a large amount of hair had formed into a solid ball that I could not even begin to get a comb into. An internet search lead me to you. I had limited success at first then it seemed no further progress was possible and she was going to lose most of the hair on the back of her head. I called the tangled hair hot line at that point gave me a few more things to try and, most importantly, convinced me that I really could get the tangle out. It took a few more days, but I made so much progress on the first day after that call, I could see it was definitely possible and my daughter is back to having a beautiful head of hair. 3 before and after photos attached here. One of the worst things mothers dread to experience is a childs hair tangled or matted beyond belief. 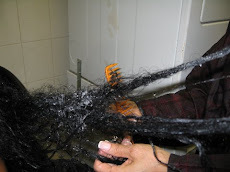 All mothers feel the pain their child feels when having to sit through hours of detangling. However, once it's over-the child forgives and forgets about the grueling hours and pain when they look in the mirror and can play with their hair again. Just like a mother who looks at her new born infant after hours of painful childbirth....the experience was worth it !! This precious 5year old girl with beautiful long hair had been wearing a matted clump of hair for 4 months that kept getting worse. Her mother was so scared and terrified. She did not want to CUT her daughters hair despite the advice to do so by uninformed hairdressers, friends and family. She was so desperate-she would not give up looking for help. She made one call to us and her daughter is smiling and wearing ponytails again.